The first figure of the new Hyundai i-oniq conception car has been released, showcasing new technology and design which present an impression of the company's upcoming philosophy. The Hyundai i-oniq is an electric sports instruction hatchback with a range-extending petrol engine. Intentional to convey the latest thinking from Hyundai's designers and engineers, the i-oniq evolves the company's fluidic figure form language and represents bold 'New Possibilities' with its revolutionary muscle train. Hyundai stylists choose dynamic magnitude to create i-oniq's visual and functional body shape. Its design combines moderate feature lines and strong surface treatment, conveying both premium and sporty qualities marked in both the exterior and interior of the car. Further design basics, such as the 'Penthouse Roof' and LED headlights, highlight the efficiency and advanced technology encased within Hyundai i-oniq Concept. Hyundai i-oniq Concept has space for four occupants in its driver-oriented hut. High-tech equipment in the driver boundary and controls reflects existing and future premium consumer electronics technology. Passengers promote from a lounge-style space designed to optimize comfort, featuring sculpted surfaces enthused by musical instruments to make an optimistic contrast with the sports-focused driver area. 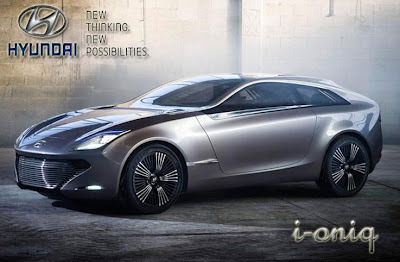 The Hyundai i-oniq Concept has an original power train that demonstrates Hyundai's dedication to clean technology. A 1.0-litre, 3-cylinder petrol engine is mated, via a generator, to a lithium ion electric motor which fabricates 109 ps. In electric-only method, i-oniq has a range of 120 km, while with support from the petrol engine it can travel up to 700 km, producing just 45 g/km of CO2 in the progression.